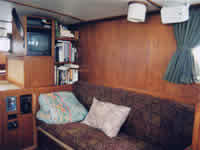 The Island Bay is fully equipped with a galley, forward sitting area, and foc'sle with double bed. There's a washroom adjacent to the foc'sle with a head (marine toilet) and shower. 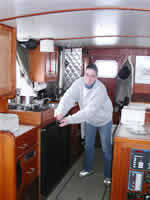 The boat sleeps seven with the galley and forward sitting area becoming double bunks at night. Setting up sleeping tents on shore to enjoy some privacy and some of the most incredible rainforest on the coast is also an option. High quality Mountain Equipment Coop tents and deluxe Thermorests are supplied - you need only bring sleeping bags. The boat has a great library as well - too great for some addicted readers. The Island Bay is not short on the bells and whistles. There's a 5 kilowatt diesel generator on board which provides lots of electricity for such conveniences as a double fridge, freezer, coffee maker, microwave, toaster, VCR, DVD and T.V., CD player, etc. 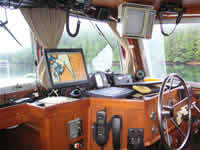 Electronics include a computerized chart system which interfaces with the GPS (Global Positioning System), Comnav autopilot with remote control on the flying bridge, 10" JRC colour video sounder, 10" Raytheon Radar, several VHF radios, Single Sideband radio, and Davis weather station. Safety equipment includes a certified Dunlop-Beufort eight man life raft, certified life jackets (as opposed to PFD's - Personal Flotation Devices), handheld VHF radios, 14 foot welded aluminum tender with Yamaha 30 h.p. outboard. The boat also has a comprehensive array of alarms providing alerts for engine malfunctions, fire, smoke and high water alarms in all compartments. She's powered with a Detroit 8V-71 diesel engine and Allison marine gear. At full power she'll do 11 knots per hour but I usually settle for an honest 8 knots per hour in the interests of fuel economy.